Kristen Stewart Shows Off Her Chanel Style at Cannes 2016 Opening Premiere! Kristen Stewart poses for photos with Jesse Eisenberg on the red carpet of the 2016 Cannes Film Festival opening gala and Cafe Society premiere on Wednesday (May 11) in Cannes, France. Also photographed on the red carpet were their co-stars Blake Lively, Corey Stoll, and director Woody Allen. The 2016 Cannes Film Festival is just kicking off today, and will run until May 22. Stay tuned for tons of event photos throughout the next several days. FYI: Kristen is wearing Chanel. Blake is wearing Versace with Lorraine Schwartz jewels. Kristen Stewart & Blake Lively Kick Off Cannes At 'Cafe Society' Photo Call! Kristen Stewart and Blake Lively strike a pose while attending their photo call for Cafe Society held during the 2016 Cannes Film Festival on Wednesday (May 11) in Cannes, France. The 26-year-old actress and pregnant Blake, 28, were joined by their co-stars Jesse Eisenberg, Corey Stoll, writer-director Woody Allen and cinematographer Vittorio Storaro. Cafe Society follows Jesse‘s Bronx-born character Bobby Dorfman as he travels to Hollywood, where he falls in love, and back to New York, where he is swept up in the vibrant world of high society nightclub life – Watch the trailer here! FYI: Kristen is wearing a Chanel ensemble paired with Christian Louboutin heels. Blake is wearing a Juan Carlos Obando jumpsuit and Christian Louboutin pumps. Kristen Stewart Joins Blake Lively in 'Cafe Society' Trailer - Watch Now! Kristen Stewart joins Blake Lively in the trailer for Woody Allen’s upcoming movie Cafe Society, set to debut on July 15 via Amazon Studios and Lionsgate. The actresses are joined by a star-studded cast for the romantic 1930s Hollywood film. The movie follows Jesse Eisenberg Bronx-born character Bobby Dorfman as he travels to Hollywood, where he falls in love, and back to New York, where he is swept up in the vibrant world of high society nightclub life. Cafe Society will premiere on the opening night of the 2016 Cannes Film Festival. Watch the Cafe Society trailer below! Kristen Stewart Charms Jesse Eisenberg in 'Cafe Society' Trailer - Watch Now! Kristen Stewart takes Jesse Eisenberg for a ride around town in the just-released trailer for Woody Allen‘s upcoming film, Cafe Society. The film is set in the 1930s and centers on Bobby Dorfman (Eisenberg) who is caught between conflicting parents and a gangster brother. Escaping to Hollywood, he finds his uncle Phil (Steve Carell), a powerful agent of stars who agrees to hire him as courier. While there, it doesn’t take him long to fall in love. Unfortunately, Bonnie (Stewart) is spoken for and he’s settling for friendship…until she breaks up with her boyfriend. Also starring Blake Lively and Anna Camp, the film will premiere at the 2016 Cannes Film Festival. The 'Sisterhood of the Traveling Pants' Cast is Reuinited! The ladies of The Sisterhood of the Traveling Pants are proving their friendship has staying power both on screen and off. Amber Tamblyn posted a series of Instagram photos this week featuring adorable past and present moments with her Sisterhood cast members. 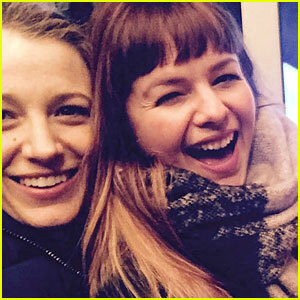 The 32-year-old actress posted throwback pics with Blake Lively, 28, and Alexis Bledel, 34, along with a pic from this year’s New Year’s Eve, which she spent with America Ferrera, 31. “#Tbt to right now. Love you sister. Happy new year,” Amber captioned the photo. Taylor Swift & Blake Lively Jump for Joy in Australia! Taylor Swift spent the day with Blake Lively in Australia and it looks like the pair had an amazing time together! The 25-year-old entertainer posted a photo of her and Blake, 28, jumping for joy on her day off! “Yesterday was such an amazing day off– roller coasters, kangaroos and LOLs with @blakelively See you tonight, Adelaide!” Taylor posted on her Instagram account. Taylor is currently at the tail end of her 1989 World Tour, which is currently in Australia! She will be in the country until December 12, just in time to celebrate her birthday back home on the 13th!